Iceland has experienced an unusual birth rate spike just nine months after its national football team’s victory over England at Euro 2016, which sent them into the tournament’s quarter-final stage for the first time in their history. The tiny Nordic nation with a population of just 333,647 beat England 2-1 in Nice on the French Rivera on June 27, 2016, with goals from Ragnar Sigurðsson and Kolbeinn Sigþórsson cancelling out a Wayne Rooney penalty. Euro 2016 was also the first time the footballing minnows had played in the finals of any major international tournament. According to Icelandic newspaper Visir, on the weekend of March 24-25 at Iceland’s National Hospital, doctors noted a record-breaking number of births, The Independent reported. A record number of epidurals – the anesthetic widely used on mothers during childbirth – were also administered. Although Iceland were knocked out in their next match against hosts France, they won the hearts of fans worldwide for their gutsy performances against 1966 World Cup winners England and their opening group game draw against eventual Euro 2016 winners Portugal. 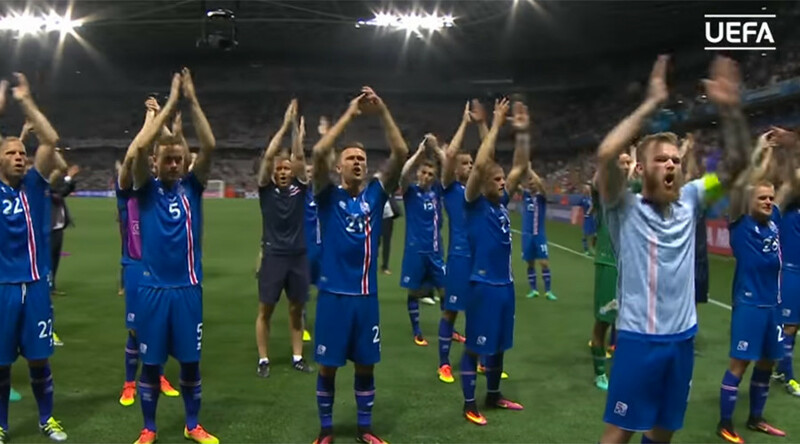 They also became famous for their unique ‘Viking Thunder Clap’ performed after every game between players and fans. The Clap was performed en masse at the team’s homecoming in Reykjavik, where they received a heroes welcome.